We mounted the cockpit controls for our 8 hp Honda on a board affixed to the table leg. 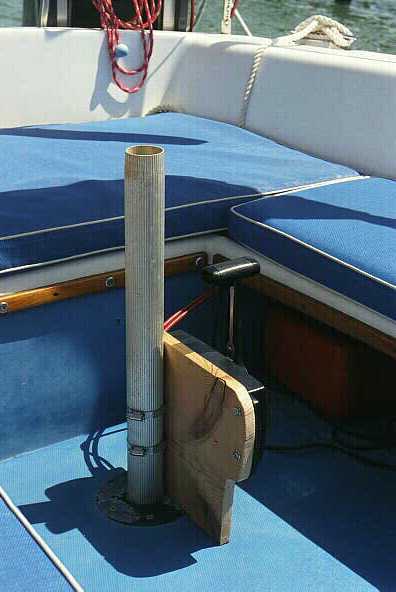 The cables go from the outboard, through the gas boot and lazarette, out under the seats to the table "pedestal". It puts all controls except the choke right under the tiller. The cables cross only a few inches of the cockpit floor and they are just flexible enough that you can remove the assembly and store it under the seats. We thought we would remove it while sailing but it really doesn't get in the way. 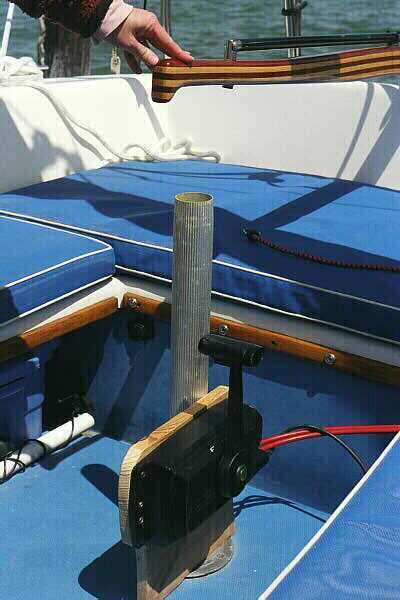 We had an extra table leg and thought we would shorten it once we had figured out the height we wanted for the controls but leg/pedestal really doesn't get in the way and we find we just pull out the tabletop and use the leg with the controls still attached when we are at anchor or in the slip. We have some scanned pictures which I can send to Michael to put on the web site. If there is anything that isn't clear in my description please let me know. As I've mentioned before, we are very very pleased with this set up. We were originally going to cut down the table leg and cap it so that it would look better and be out of the way more but we've discovered that we don't mind using the leg for the table with the controls attached and that if you don't have to swap out table legs it is one less step to set up for dinner when anchored out or to clear away and get going in the morning. We do leave the controls in place when anchored out in case we need the motor quickly. Its always harder to develop something for the boat if Stan hasn't already done all the heavy lifting before you get there. I remain extremely pleased with my port rail mounted remote control system. Since you last saw it, I have upgraded the cables to eleven foot Morse Supreme Red Jacket. These premium cables allow much tighter bends, and still move more easily than regular cables. The cables are now routed outside the boat, through the aft port eye, before curving back into the boat to make a straight run into the cable guides on the motor. With the motor raised, no cable extends in front of the traveler. With the motor lowered, all of the cable is pulled behind the motor mount. In neither case is any cable on any surface within the boat. Next season I will clean up the installation, and attach electrical connections to the remote control which will allow me to drop the motor, start it using a key, and control both the motor and the tiller from my captain's chair. I look forward to that. There were several instances this summer when I wished I had that capability. I like the intuitive nature of the single handle remote control system. Push forward to go forward, pull back to go back. The farther you push or pull, the faster the motor goes. It's out of the way when you don't need it, and right where you want it when you do need it. I'm still thinking about slaving the motor to the tiller, and I'm interested to see the comments of people actually using the system. However, the longer I think about it, the better I get at controlling the boat without it. It's one more thing to attach and detach, and it makes the "light as a feather" tiller heavy. So, for now, I'll just keep thinking about it. Once before you gave us info on the cost of the remote set up from Histon Marine. I caklled them and they are quoting a price of almost $400 for parts - remote bracket $80; control $248, cable $ $80 - $100. No labor included. How does th9is compare with your numbers? I had the work done by Hilton Marine in Delaware. The quote sounds about right, I can't find the original invoice but based on the canceled check your numbers sound about right. The cables are really expensive! I dropped off the motor and asked them to install the parts and get it working and then to dissemble and label everything so that I could reassemble all after running the lines through the "gas" boot on Fretless. I did need to make some minor adjustments until I was satisfied that all was what I wanted. Not a problem. Expensive cables are worth the money. They bind less is everyday use, and can bend more sharply without binding at all. On our smaller boats, we are more likely to encounter sharper bends, and fewer alternative methods of routing the cables. The difference between good quality less expensive cables and great quality more expensive cables is remarkable, and something you will appreciate every day when your remote device operates smoothly every time you need it. Moreover, since our boats are smaller, the cables we need are not terribly long. So while the best cables may cost almost twice as much as good cables, the difference may be less than $50. It's money well spent.